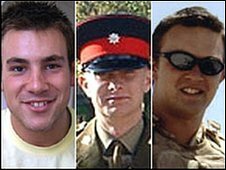 The deaths of three Royal Anglian soldiers killed by "friendly fire" was down to "flawed application of procedures," an inquest has been told. Pte Aaron McClure, from Suffolk, Pte Robert Foster and Pte John Thrumble, both from Essex, died in August 2007. They were under fire when a US F15, called to help, bombed them instead of a Taliban position 1km further north. Coroner David Masters told the inquest in Trowbridge an Army panel had found it was not down to "recklessness". Instead the panel found it was down to the "flawed application of procedures" and not down to anyone being "reckless or dangerous", Mr Masters said. The panel made 39 recommendations, 26 of which have already been implemented, the court was told. One of the rules already put in place is that no bomb will now be dropped unless there is a "comprehensive list of facts". The bodies of Pte McClure, 19, and Pte Thrumble, 21, who were killed instantly in the blast, were retrieved under mortar fire. After returning to base, it was discovered that Pte Foster was unaccounted for. A search party later pulled the 19-year-old's body from rubble using their bare hands. Post-mortem tests showed Pte Foster died of asphyxia caused by entrapment following an explosion. Throughout the inquest the mothers of the soldiers, who were all members of 1st Battalion The Royal Anglian Regiment, have sat with framed pictures of their sons in front of them.